Tiffany Jones is the owner of Peridot Sweets (pronounced "pear-ri-dough" after her birth stone) and she and I have known each other for over 6 years now. We worked together at the Four Seasons Hotel here in Las Vegas many years ago. Originally from San Diego and trained at the California Culinary Academy (Le Cordon Bleu) in my hometown of San Francisco, Tiffany has worked in professional kitchens including the Four Seasons Hotel and Mirage for over six years. One of these years, Tiffany had the privilege of working for pastry chef Stephane Treand, who has the distinguished title of MOF (Meilleur Ouvrier de France – Best Craftman in France). Describe your perfect day off. It would start with a cup of coffee with peppermint mocha creamer, followed by a hike with my husband Jason and dogs in Mount Charleston. Dinner would be at Grimaldi's or Lotus of Siam, and the day would end with an episode (or three) of Sons of Anarchy. Beer or wine: I wish I could be one of the "cool girls" and say beer, but definitely wine. Riesling is my favorite, but since Jason is a sommelier, he's exposing me to more "interesting" varietals! Coffee or tea: Coffee in the morning, tea throughout the day. Do I have to choose? Coffee. There are so many fun creamer flavors out there. Heels or flats: Heels! Flats actually hurt my feet. Favorite candy bar: King-sized Snickers! The ratios of chocolate/caramel/nougat are different, I won't eat any other size. Favorite cake flavor: Chocolate with peanut butter mousse. Favorite dessert item to make: Toss-up between French macarons and my Gemmes! Macarons are just so pretty. But the Salty Pink Caramel Gemmes are like gourmet "Twix" (caramel-topped shortbread enrobed in milk chocolate) and total crowd-pleasers. Email, phone, or text: E-mail for business, phone for family, text for friends. Stay in/or go out? Stay in. Even when I was in my early 20s. My 4Runner turns into a pumpkin at midnight (make that 11pm). If you had to only wear one makeup product, what would it be? Mascara. I have huge eyelids and look like Garfield the Cat without it. 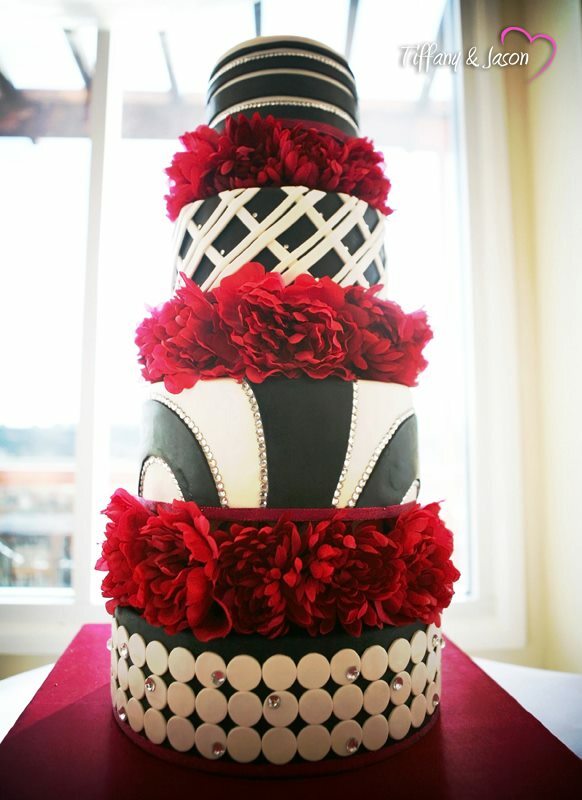 She designed and created her own wedding cake! A Chinese themed wedding cake from a styled shoot with Chelsea Nicole. Tiffany can make almost anything for a dessert station. She once created a live s'mores station as well as a banana split station.